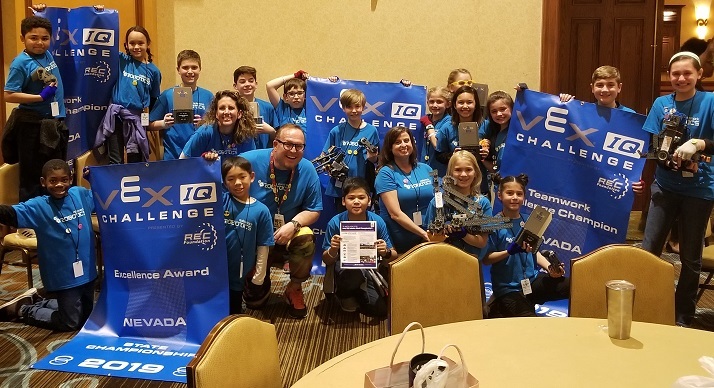 The three robotics teams at Nate Mack Elementary School excelled at the Vex IQ Nevada State Robotics Competition, held Feb. 1 and 2 at the Texas Station. The school’s three robotics teams, comprised of fourth- and fith-grade students, competed against 18 other teams from across the state in the elementary competition. Middle schools competed in a separate event. Robotics Coach Casey Juliano said Mack’s three teams won five of the seven awards at the competition, and qualified to compete in the Vex IQ World Robotics Competition, to be held April 27 through May 1 in Louisville, Kentucky. Juliano said the next step is for the school to raise $28,000 to finance the teams’ trip. More than 30,000 people, including 1,648 teams from 30 nations, will compete in the World Competition. Mack Elementary School’s robotics program is in its third year and the funding has come from grant-writing and fundraising campaigns. For more information, call 702-575-5689 or email juliacm@nv.ccsd.net.